I love a fun and cheap party! A few weeks ago my cousin came down and threw a Lu La Roe party for me and my friends. She brought all of her cute clothes, and I provided the treats. It was a fun excuse to get some decorations together! I decided to do soda bar with cookies. Super easy to do, and I got all of the decorations at WalMart and The Dollar Store! Super thrifty, but super cute! We cut up some lemons and limes and provided some cherries to go on top of our sodas. We served all the drinks in mason jars with cute straws in the cups. I cut out labels for the sodas on my Silhouette and used a chalk pen to write the names of the drinks and creams on them. If you haven’t tried Coconut Cream Coffee Creamer in your soda, you’re missing out. It’s delicious in Diet Coke, and Diet Dr. Pepper. Super GOOD! I made my dad’s famous sugar cookie recipe. You have to make these if you haven’t already! Here’s the recipe! I love these paper straws I got at WalMart! So fun! I put the creamer in some old syrup bottles, and tied them with ribbon too. You only need 2 pumps of these beauties to make your soda deluxe! I didn’t get good pictures of the gold bin in the back, but I spray painted a plastic bin from the Dollar Store too, and I put a bowl of ice inside with a scoop! I was surprised how well the gold metallic paint stuck to the plastic! These chocolate mint cookies were also super delicious! I’ll share the recipe later this week! All the flowers and jars are from the Dollar Store. They were just clear glass and I spray painted them with black and red and tied cute Valentine’s Day themed ribbon on it. I provided some water with strawberries and oranges sliced up inside for anyone who didn’t want to partake of the delicious soda, but it turns out the water was better than the soda! Just make sure the fruit has time to soak for a few hours! 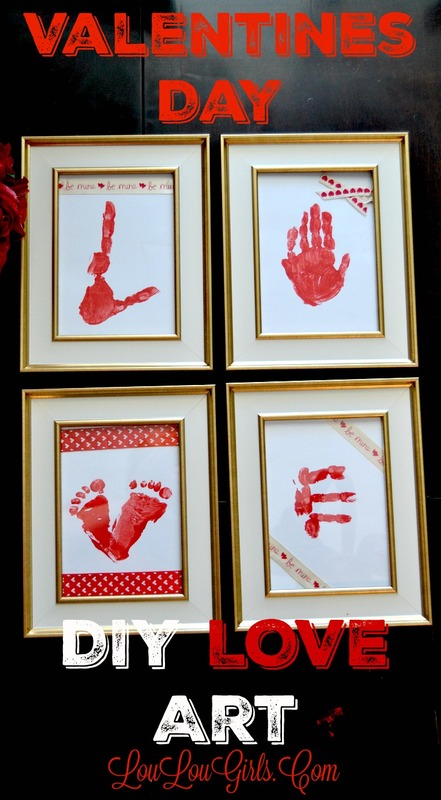 I made these Valentine’s Day DIY Love Art Frames last month. Click here for the tutorial! The tablecloth can be colored on and it was really fun for the kids! I love a good and cheap party! OMG I love Dollar Store finds like these! I'm a total Dollar Store junkie … you can find the coolest things there for next to nothing! I know what's going to be my Sunday's Best pick for week #59! This looks amazing! Great catering ideas. Yes!!! We think alot alike as far as cheap fun!!! I love these ideas! Added this to my valentines post and going to be doing some as well.Thanks for sharing Girlies!! Fun! 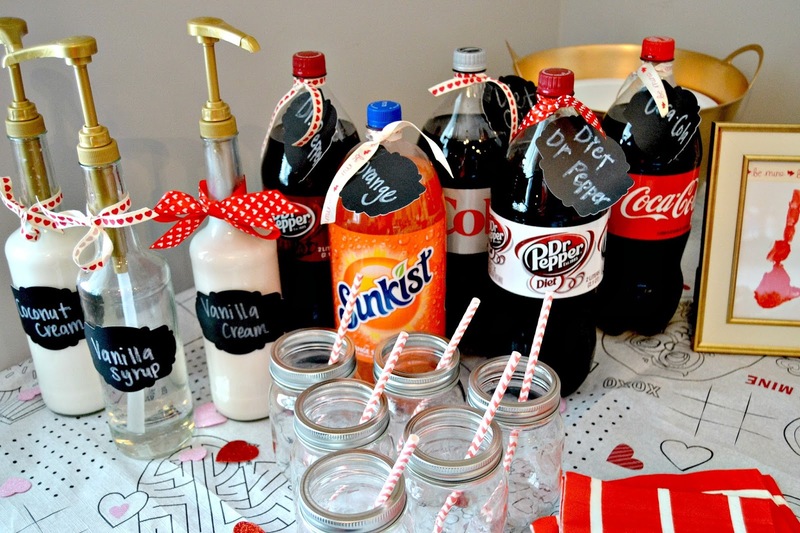 I love a cute party that is frugal. Cute ideas! What a cute looking party! Great ideas! Thanks so much for sharing at Oh My Heartsie Girls Wordless Wednesday! What a cute bunch of ideas! Thanks for sharing at #overthemoon! Wow you really went to town! Great attention to detail, I love that you really have thought about everything. Wow what a beautiful party set up and even better from the Dollar Store! The sugar cookie look so delicious, we will have to try making them. We love fruit flavored water too. Thanks! Yes, the sugar cookies are to die for! I love the "make your drinks deluxe" idea!! Thanks for joining up to the Tips and Tricks link up party! What a great party. 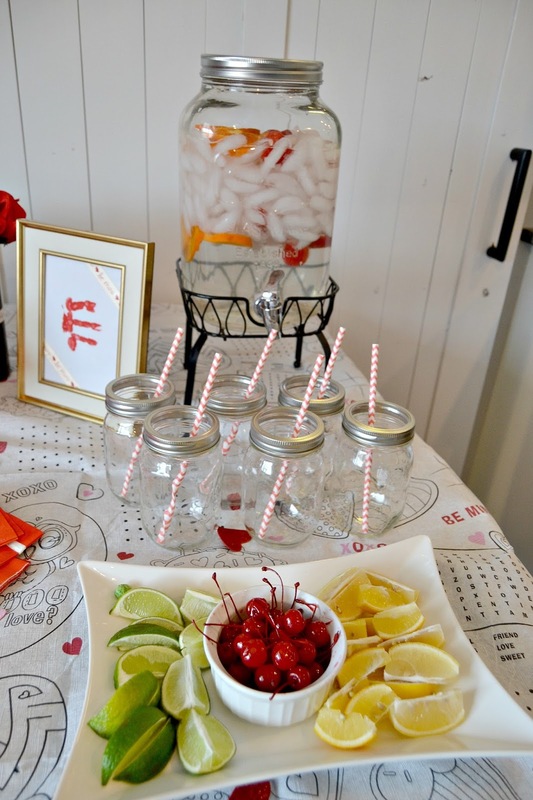 Love all the decorations and how you can find so many wonderful items for a party at the Dollar Store. 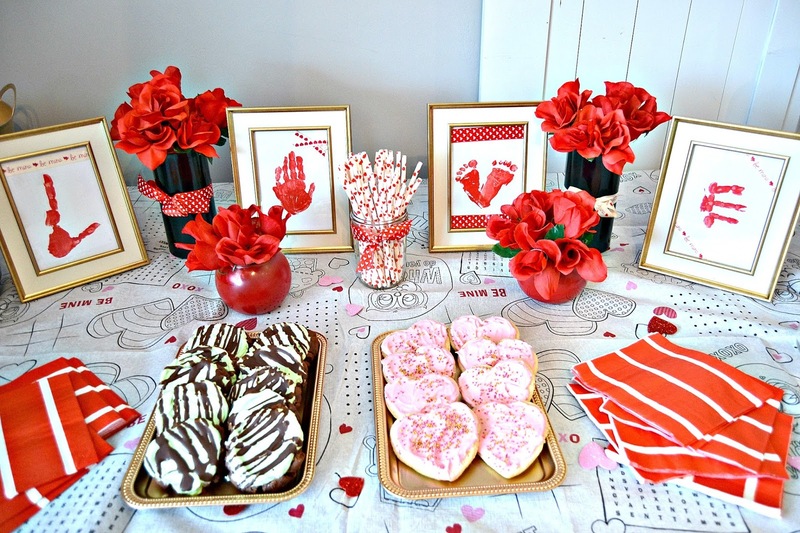 that is great valentine party with affordable price, thanks for sharing with Hearth and soul blog hoop.